As the year comes to a close, the inhabitants of Earth are in for a joy ride of pure eye candy. I’m not talking about fireworks… obviously. I’m talking about something that is many times better than fireworks. And it’s the supermoon extravaganza of 2016. Did I tell you that it’s going to be the most amazing one as well? Photographers and astronomy lovers around the world are eager to witness the Supermoon, which is going to be visible on November 14, 2016. If you are a Doha dweller like myself, this guide is THE ONE you should be referring to if you want to make the most of the sightseeing tomorrow. Before getting into the techie bits, here are some interesting bits of information about tomorrow’s Supermoon. This full moon, aka supermoon, will not only be the closest and brightest supermoon of 2016 but also the largest since 1948. And the next one, to come this close, according to Nasa, won’t be until the 25th of November 2034, that’s 18 years away. So make sure you don’t miss this opportunity. Qatar may not be the best spot on Earth to observe the supermoon tomorrow but it is still good enough. As days are getting shorter, we are in luck. The guide below will help you make the most of the event tomorrow. For your convenience, all the timings mentioned in the article are according to Doha local time, which is GMT +3. The supermoon will reach its peak tomorrow at 4:53pm local time. As you can see from the snapshot above, Supermoon will reach its peak size at 4:53pm tomorrow. But there are two tiny problems. Firstly, the sun will set at 4:46pm (see above) tomorrow so by the time the supermoon reaches its peak, we will still have the Sun’s orange light, with some blues on the opposite side in the sky. Secondly, the moon will still be below horizon at 4:53pm time (see below). Now that’s a bummer, but not to worry as we will still be able to catch quite a lot of the spectacle tomorrow if we wait just a few minutes longer. Luckily for us Doha residents, not all hope is lost. The moon will begin to rise at 4:58pm (see below). And I would strongly suggest that you are already at your sightseeing spot in advance. At 4:58pm, the moon will begin to touch the horizon as it rises so you will have to wait few more minutes until it rises a few degrees and becomes observable. If waiting is not your thing (well, it’s no body’s), and you want to stay motivated, here is something that could help. The moon is usually at a distance of 404,000 km or more from Earth. But tomorrow’s supermoon will be at an incredibly close distance of just 356,511 km from Earth at its peak. Enough to keep you excited? Supermoon will be visible in the direction of East North East (see below). As mentioned previously that the moonrise will begin at 4:58pm so you will have to wait few minutes. By 5:15pm, the moon will rise a few degrees above the horizon. 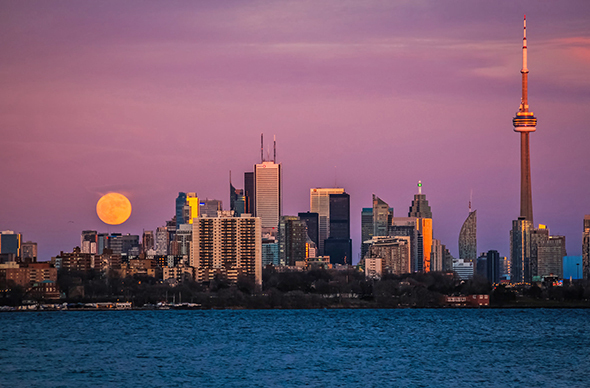 The most important requirement for tomorrow’s supermoon observation is AN UNOBSTRUCTED VIEW OF THE HORIZON. Did I just write that in bold and caps? Well then, you can guess the significance of that point. This whole exercise of trying to observe the amazing supermoon will go in vain if you don’t have the best seat in the house to experience the event. I have done my research on it which should help you get the best view of tomorrow’s supermoon. Here are my top recommendations of best spots for observing the supermoon tomorrow. Instead of sharing snapshots of Google Maps, I’m sharing geo-tags so that you can see the exact spot I recommend. Here are some great spots at the corniche. If you are a resident at the Pearl or have access to any of the towers, you can see an amazing view of the supermoon. You will also get a beautiful view of the supermoon from the ground if you can be at beach areas in the Pearl. But if you are at the Pearl tomorrow and don’t have the options mentioned above while, you may still get a beautiful view of the supermoon from the family park area (see below). If you are working tomorrow in any of the towers in West Bay aka Doha Business District, and have access to a roof, or have a big window with clear view looking towards East from a higher floor, you will witness an amazing rise of the supermoon. Below is just one of many towers that will offer a sweet viewing experience for supermoon observers. In addition to the above, the entire beach area at Souq Waqif in Wakra will offer an excellent view of the supermoon. The entire port area in Al-Wakra is at your disposal to witness and enjoy the supermoon tomorrow. If you happen to be at the resort, make sure to head to the beach area by 5:00pm and wait for the moonrise. No resort, no problem. The beach area next to the resort is open to all. Of course, if you are up on a sand dune in Mesaieed, you will get an astonishing view of the supermoon tomorrow. So get your SUV ready if this is the spot you’d like to observe the supermoon from. Hamad International Airport: If you are there by any chance near the departure terminal entrance, look towards East North East and witness an unmatched view of the rising supermoon above the sea (see below). Supermoon shots literally look “super” when the moon is composed against familiar subjects in a way that gives emphasis to the moon in terms of size. In simple words, if the moon looks much larger in the composition compared to other subjects, such as people, trees, monuments, skyline etc., then your shot will have a wow factor. If you look at the cover image of this article, you can instantly recognise the silhouettes to be people standing against a much larger moon. Focal Length: On a full-frame sensor, the focal length should ideally be 200mm or above. 300mm and 400mm would be excellent. If you do not have that focal length, you can always use the crop mode on your camera. Or you can just crop it later to emphasize the scale of the moon against your subject. Subject-to-Camera Distance: Pairing a 300mm or higher focal length is only first step of the process. The most important step is to place the subject at the right distance from the camera. If you want to capture a silhouette of a person against the moon, your subject should be 100 to 200 meters away. The idea is to bring the subject and the moon in the same plane, that is, infinity. Doing so will eliminate the need to shoot at a higher f-number such as f/11. Aperture & ISO: If you follow the steps mentioned above in composing your shots, you will be able to use a smaller f-number such as f/2.8 or f/4. For the best image quality, I always prefer the lowest native ISO. Most cameras have a native low ISO of 100. But you may have to bump it up a bit to 400 to keep a faster shutter speed. I suggest using aperture-priority mode. White Balance: You can keep it to Auto but make sure to shoot in RAW format so you can get the most out of your image data while post-processing, and retain the ability to adjust white balance later for creative intent. Tripod: Evening, night or most kind of low-light shots should be taken with the camera mounted on a tripod. In the case of the supermoon, a higher focal length is a requirement which makes it even more important to use a sturdy tripod. I hope this guide will help you experience one of the rarest phenomenon of the decade in a way which will be memorable and hopefully preservable too, if you are carrying a camera with you tomorrow. Feel free to ask if you have any questions or would like to know more. Have an amazing supermoon.